What smartphones and apps have done to connect people to the Internet wherever they go, emerging new technologies will soon connect seemingly every other object in your life (even the most nonelectronic in nature) to the Web. 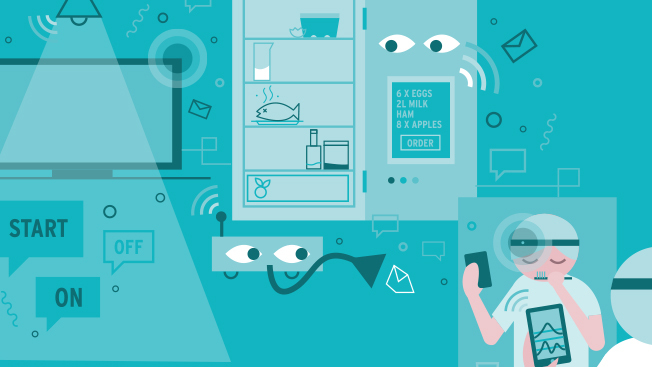 It’s a weird phrase you’ll hear a lot this year: the Internet of Things. These “Things” aren’t new. They’re mundane devices—lights, garage doors, toasters and other household appliances—all tricked out with sensors and wired into semi-autonomous algorithms. It’s all designed to give consumers more control, make their lives easier, give them more information—in short, to borrow from a famous slogan, to bring ordinary things to life. Or, to go a little darker, it’s like Skynet from the Terminator movies right before it turns on humankind. Take your pick. At last year’s International Consumer Electronics Show, attendees witnessed a coming-out party for the Internet of Things. Many of those things, including watches or sports aids like a golf tee to help you with your swing, did one thing really well. But those devices didn’t talk to each other. This year, because they are starting to share information, they’ll do more than just one cute trick. Three emerging technologies will lend the IOT its intelligence: sensors that can track temperature, movement or speed; systems that integrate the control of devices; and a shared syntax that lets them talk to each other. Think of thermostats that turn down the heat after everyone has left the house; smart calendars that tell you to leave for that important meeting right now because traffic is bad; a refrigerator that updates your online grocery order when your milk has reached its expiration date or your lettuce is wilted; apps that adjust your prescription dosage based on diet and exercise for the week; or the robotic vacuum cleaner that activates after the 20th person has walked through the door. Once the devices can talk to each other through the Internet, the consumer won’t have to push a button to make something happen because the devices will anticipate what you want. Yes, we are headed to a Jetsons kind of future. There is even an Internet of Things Consortium that brings together companies making IOT devices and services to tackle business and marketing challenges. Last year, it had 10 company members; today there are more than 100. From another perspective, a staggering 10 billion “things” are now connected. By 2020, that number is expected to hit 50 billion, according to Cisco, and generate global revenue of $8.9 trillion, per International Data Corp.
Just think of the data that IOT could generate. By 2020, from 50 billion to 75 billion connected devices will create 13 quadrillion connections to the Internet and generate 200 exabytes of data a year. (The Library of Congress houses 5 exabytes.) It’s data that ostensibly can be used to improve consumers’ lives and indubitably will be used to market to consumers—bringing a whole new meaning to “reaching the right consumer at the right time with the right message.” Like personal computing and the smartphone did before, IOT will forever change how we live, work and play. With all that potential comes just as much fear and loathing about the negatives. It’s little wonder that policymakers and privacy advocates are on high alert. The Federal Trade Commission has already held a workshop on IOT; it’s even brought a couple of small enforcement cases. “There will need to be new social norms, economic models, regulations and personal boundaries frameworks reenvisioned and developed,” says Michael Becker, North American market development and strategic advisor for Somo, a global marketing company. Though we shouldn’t yet send a terminator back in time to protect Sarah Connor, here are three significant categories that soon will be transformed by IOT. This area of development may not be new, but it used to consist of expensive proprietary, stand-alone systems that made it inaccessible to most consumers. Now with WiFi, smartphones and wireless sensors, home automation is about to go mainstream. Already companies are offering app-controlled Internet-enabled devices: Hue lights; Schlage locks; Nest learning thermostats; Whirlpool washers, dryers and dishwashers. But who wants a bunch of home apps littering their smartphone screens? Now all these disparate household devices can be managed with a single dashboard app on a mobile device or computer. SmartThings is a leading integrator, but there’s also Nexia, Revolv and Lowe’s. Designed as an open system, SmartThings allows consumers to choose and connect different brands and create their own recipes for lighting, heating, security and surveillance. “We’re creating the smart home and making it mass-market accessible,” says Alex Hawkinson, founder and chief executive of SmartThings, which will feature a smart model home off the Las Vegas Strip at the CES. SmartThings is competing in a market that has big brand proprietary systems like AT&T Digital Life, ADT, Comcast and Verizon. Can these systems make the leap beyond early adopters like Google’s vp and chief Internet evangelist, Vint Cerf? Not everyone will want to carry a smartphone with them from room to room, so voice and gesture control, already used in many smart TVs, will be front and center at this year’s CES. Voice control is about to turn on your lights, start the washer, lower the curtains and turn on the TV. This emerging technology is offered by companies such as Nuance, already in automotive brands such as Ford, BMW and Audi, and smart TVs from Samsung and LG. SmartThings will feature voice interaction in its model home. Further up the road, gesture control will move from gaming to home automation. PointGrab plans to have its first products ready for integration later this year. In many ways, the connected car is already here and remains a top focus of auto and electronics firms. According to Strategy Analytics, 59 percent of U.S. smartphone users utilize apps like navigation to aid driving. More than 13 million use a vehicle safety service like OnStar or BMW Assist, per CEA. One in three consumers considers smartphone connectivity a must-have feature for their next vehicle. Wireless sensors, now smaller and less expensive, are really driving this category. In sports, the 94Fifty basketball from InfoMotion Sports Technologies employs nine sensors in its regulation size and weight model. Who needs Bobby Knight when the ball can track trajectory and give visual and voice feedback for every shot and dribble? Blending sports with health, Reebok’s Checklight is a skull cap with embedded motion sensors to make sure an athlete should continue to play. MC10, which developed the product with Reebok, is also working on several digital health products like a baby-monitoring skin-like patch that continuously monitors and wirelessly transmits the baby’s temperature to a smartphone. The number of digital health exhibitors is up 40 percent at this year’s show, with more than 65 pitching digital solutions for diagnosing, monitoring and treating. Medissimo has a smart pill box, which dispenses meds at the right time and shares the data with the prescribing doctor, who can monitor the efficacy of the drug regime. Then there’s the Scanadu Scout. Like Bones’ tricorder in Star Trek, the hockey-puck-size device is held to the forehead to deliver heart rate, EKG, temperature and blood pressure to a connected smartphone, all in 10 seconds. The company is also working on Scanaflo, which will offer a complete urine analysis test in minutes.